I don't need to tell you the current round of US primaries to decide on the two parties presidential candidates have the commentariat in a bit of a tizz. Trump has stolen the show by saying things candidates to lead the world's foremost superpower really shouldn't be saying. We've had arguments over the size of hands (and what that represents), un-becoming spats involving the candidates wives and announcements of policies so ludicrous you'd think a ten-year-old could do a better job of running a campaign: Exhibit 1: Trump's plan to ban all Muslims until quote 'we can figure out what is going on'. We're not here to get involved in the actual politics of the US election, but if you look at some of the big trends emerging from US politics you can draw out some genuinely important lessons for marketers. After all, as these analyses show, the 2008 and 2012 Obama Presidential campaigns are seen as changing how political campaigning forever thanks to social media. Aside from the important but obvious and generic 'Social Media is really important' kind of lessons, there is actually a lot to be learned from how the various campaigns are utilising data to win votes, the political equivalent of 'conversion', if you think about it in marketing funnel terms. As one of the biggest providers of digital ads, as well as the largest social network, it's hardly surprising that politicians of all stripes are using Facebook for their campaigns. But what you may not be aware of is Facebook is actually developing tools designs specifically for election campaigns. Last year Facebook provided a way to send people targeted messages via Facebook by uploading lists of people to the site, useful for all marketers, but particularly handy for campaigns with big lists of supporters that they need to message to get out the vote. Facebook has now developed a new service that allows campaigners to reach users who 'like' and 'share' a lot of political content. If you can convince these people, who may well be mini-influencers among their set of friends, then it amplifies your message. One of the key lessons campaigners have learned is that using the power of digital for getting quick feedback is a fantastic way to perfect their messaging. North of the border in Canada Justin Trudeau's campaign spent most of its budget on social media, because it couldn't afford many expensive TV ads. It turned out to be a blessing in disguise and helped his liberal party win the campaign. His campaign would create an ad, see how people reacted to it on Facebook, alter the content then test it again on Facebook. Mr Pitfield, the man in charge of the party's digital campaign said that on some days they would produce more than 50 different ads, to see what messaging worked perfectly. The rapid feedback provided by Facebook let them be more flexible and perfect their messages much faster than the competition. It also meant they could be more targeted in their ad delivery, helping get more bang for their buck. In marketing terms, they delivered strong ROI. Obama's successful 2012 election campaign blazed a bit of trail when it came to testing messaging. They tested the subject lines of fundraising emails, and found that the subject line 'I will be outspent' raised over three times what the subject line 'Do this for Mitchelle' generated. This is another area where the 2012 Obama campaign has a lot to teach us. To find out where best to spend its limited budget, the campaign used polls and other data to generate a statistical model of the attributes potential Obama supporters had in common, which could then be used for more sophisticated targeting than just by location or individual interests. Once clever trick was to find out if a certain group of voters watched certain TV shows, and then target TV ad slots during those shows to get much better value of a limited ad budget. The key objective of the digital element of the Obama campaign was getting their supporters out to vote. They knew that they had broader support than the competition, but also knew their supporters were less likely to turn out to vote on the day than republicans. The key to getting out the vote was the ground campaign- that's political talk for getting people to knock on doors in local areas. If you replace door knocking with getting sales to ring leads, then it will all start sounding very familiar to plenty of markers. The best way to get people to buy is to ring them up and talk one to one, but sales only have so many people able to make so many calls in a day, and of the thousands of people that visit your site only a small percent will actually be ready to buy and thus worth calling to sell to. The Obama campaign set their statistical models to work, using data gathered online to work out exactly what kind of people were most likely to vote for them. The results speak for themselves. When volunteers knocked on doors in 2008, four out of ten people they met backed Obama. In 2012 the ratio was nine out of ten- helping them get out the vote much more effectively. Marketers can use similars tactic to model exactly who will be most likely to want their products and then focus ad-spend much more precisely on those groups. Producing a good statistical model of exactly what your customers have in common isn't easy, but the results can be fantastic. Is social media the future? All the candidates in US election so far have taken to social media to spread their messages, generally with pretty impressive results. Trump's 7 and a half million followers make him the most followed of all the politicians in the current election, and whilst is somewhat crazy first person style may often be rude and obnoxious, it seems to work to galvanise his followers. He is winning his party's primary after all. 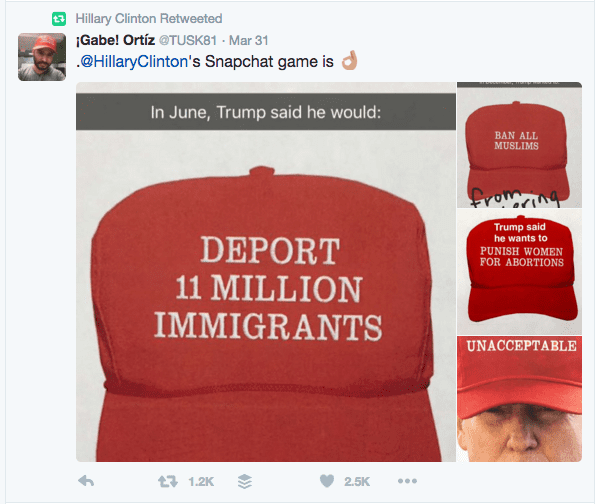 Clinton's Twitter is only just behind Trump's on almost 6 million followers, although it isn't quite as rambunctious. She generally does a very good job of using the platform, with a mix of Tweets, images, videos and re-tweets which make her seem human and connected to the electorate. That said, she did get some rightly deserved flak for the tweet below, which made her seem patronising to younger people. But it isn't just Twitter where the candidates have been spreading their messages. On the democratic side, we've seen some more imaginative ways of getting the word out. 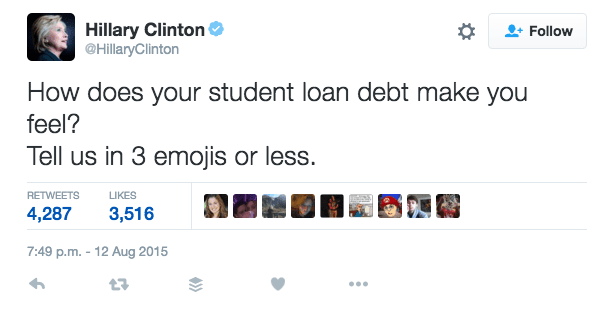 Clinton has taken to Snapchat, with some generally impressive results. Because young people are generally tending to lean towards her democrat rival Bernie Sanders, Snapchat opens up a way of connecting with that demographic. Bernie has had no problem in connecting with younger voters. In fact, his surprisingly popular campaign has gained such large support with young people in part due to messages spread organically by fans on social media sites like Reddit. 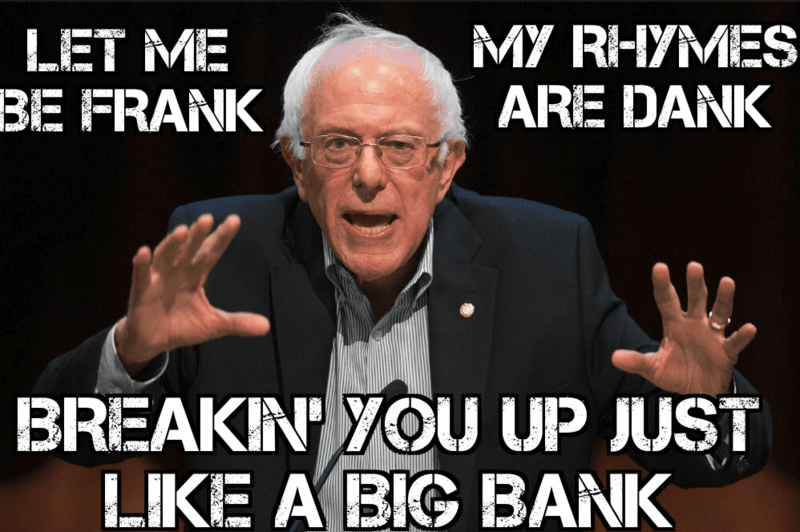 One of the most bizarre yet interesting developments is the growth of 'Bernie Sanders Dank meme stash', a Facebook group of some epic proportions. With a membership of 433,000 that grows by the day, the group has developed a momentum of its own, and has even garnered national media coverage. 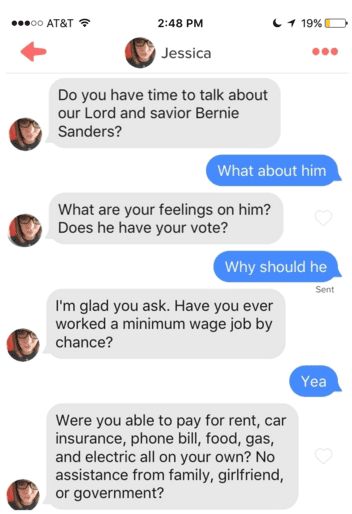 Perhaps even more strangely, a group of women in the US has even taken to Tinder to spread Bernie's message to America's youth. Whilst we can't really recommend that as a marketing tactic, it does show it's important to think outside the box and make the most of the latest marketing mediums! Elections in the world's richest, most powerful country invariably draw a lot of attention. They also draw billions in campaign funding. Only 1 person can win, and 300 million people have a stake in who does. All this adds up to one enormously important competition, that leads people to put an awful lot of effort, time and money into winning it. This means inventing new, clever and efficient ways to market their candidates, and get people to vote for them. So marketers would be wise to take notes from this electoral season. This cornerstone of democracy is also a crucible in which new tactics will be forged. 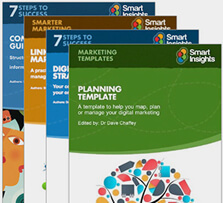 Testing, Targeting, Personalisation, all on the back of ample supplies of data. This is the future of both elections and marketing.